Turns out, it wasn't exactly in That pile. It was off to the left of the picture, under the paper? 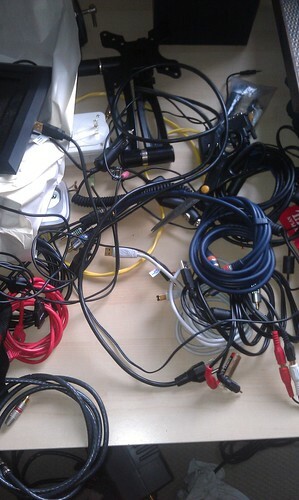 There was another similar pile of cables. Yup, we're organized like that. There are all nicely wound up though, aren't they? My computer is actually set up. The problem? The room it's set up in doesn't have any connection to the internet. So I'm using my laptop which isn't a problem at all - I'm using it for work anyway. I'm just a creature of habit and my habit is to blog from my desktop. I wish I had a better explanation for that. I have taken some pictures with my phone that I'll share with you. On the labour day weekend, I had a mini quilt retreat with my Mom. 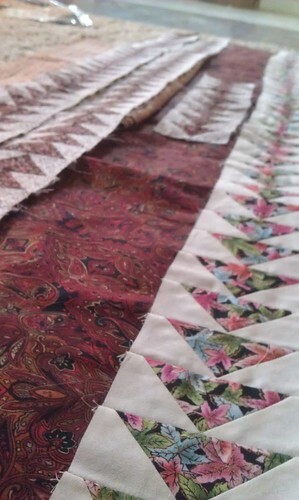 This project all started with a ridiculous piece of fabric from my grandmother's stash. Mom inherited it and we looked at it and couldn't even figure out what the pattern was supposed to be. That fabric at the bottom of the picture? That's what started it all. Is that pineapples? Airplanes? Trees? WHAT??? Regardless, it started a search in an effort to save it. 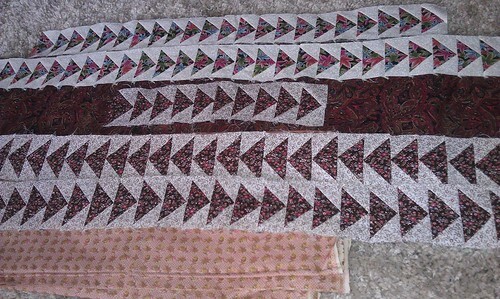 All of the fabric for this quilt is from my stash and Mom's stash, with the majority of it (I believe) coming from Grandma's stash. 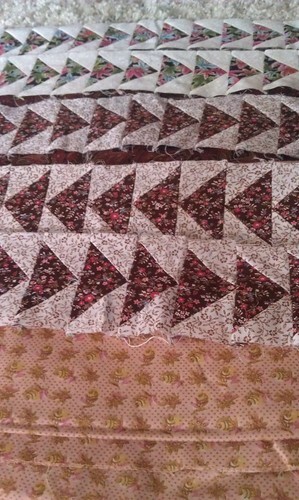 It's going to be a twin size when it's done and it will use almost all of the ugly ugly fabric. woo hoo. So. Friday is my day off. What should I do on my day off? Work on the geese? Move the computers to their ultimate destination and get them all set up? Go thrift store shopping for fabric or stuff for the house? Finally hit the quilt store in town?